is the third yearly release of the Royal Canadian Mint’s extremely popular “Call of the Wild” series, featuring famous predators that have inhabited Canada for centuries. 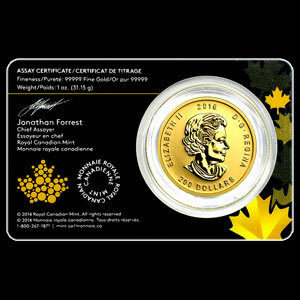 Each beautifully struck coin contains one troy ounce of .99999 gold, the highest purity of any gold coin in the world. Each coin comes in a plastic sleeve with an assay card. The obverse depicts Susanna Blunt”s portrait of Her Majesty, Queen Elizabeth II, along with the $200 face value designation and the 2016 mint date. 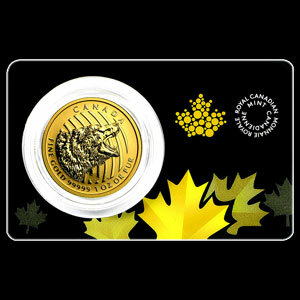 The reverse portrays a roaring grizzly bear, designed by the Royal Canadian Mint artist, Pierre Le Duc. The Roaring Grizzly is a handsome addition for any serious collector.